Geometiles® makes exploring math accessible for everybody. A multi-award winning versatile set of interlocking tiles, Geometiles® supports math exploration for students, parents, teachers and those who are just curious. The purchase of any Geometiles® set gives you lifetime membership to a valuable resource library filled with downloadable workbooks, instruction manuals, lesson plans and hundreds problems. The library enables you to quickly incorporate Geometiles® into your math instruction or working with your children at home. Whether you are a parent, teacher, or kid, Geometiles® provides hours of fun activities and learning opportunities no matter what level of math interests you. Designed by a math Ph.D., teacher and mother, Yana Mohanty, Geometiles® can cater to everyone from first graders to adults. At Geometiles, we are committed to supporting the American economy. All of our products are 100% made, designed and assembled in the USA. Check out our photo gallery to see Geometiles® in action! Yana Mohanty is passionate about math. After graduating from UCLA with a Bachelor of Science in Electrical Engineering, she earned her Master’s Degree in Electrical Engineering from the University of Massachusetts at Amherst. Continuing on, Yana earned her Ph.D. in Mathematics at UCSD in 2002. She taught mathematics for five years at UCSD, and for a year at Palomar College. Yana started her career as an engineer and then moved into teaching where she discovered her love of instilling curiosity and love for math in both children and adults. She co-founded the San Diego Math Teachers’ Circle and also teaches kids grades 5 and up in the San Diego Math Circle. Also, she has volunteers at her daughter’s school as the a math coach for the past 3 years. Yana’s unique background combines the rigor of pure mathematics, the nuts-and-bolts of engineering, and the personal touch of a teacher and a mother. Yana spends lots of time with kids and math and has found that one of her greatest challenges (and her greatest joys) is showing her students the connections between classroom math and the real world. 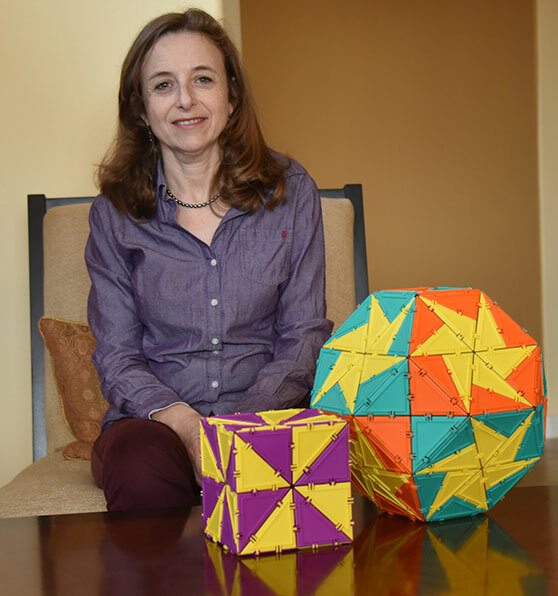 Geometiles® was born from her desire to give students an enjoyable and tactile experience of fundamental math concepts.